$29.99 to $49.99 & FREE Shipping on orders over $59 $35. 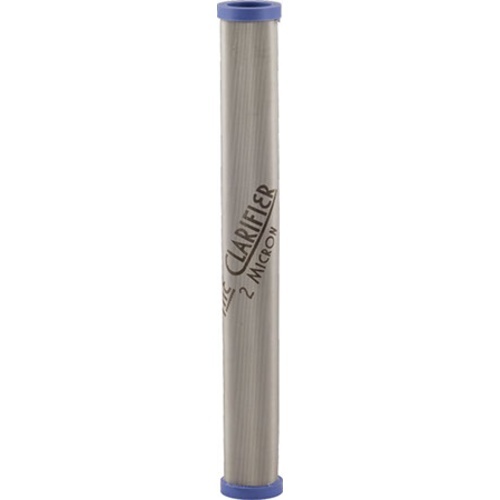 The Clarifier is a new, reusuable, stainless steel, multistage filter cartridge for beer and wine. 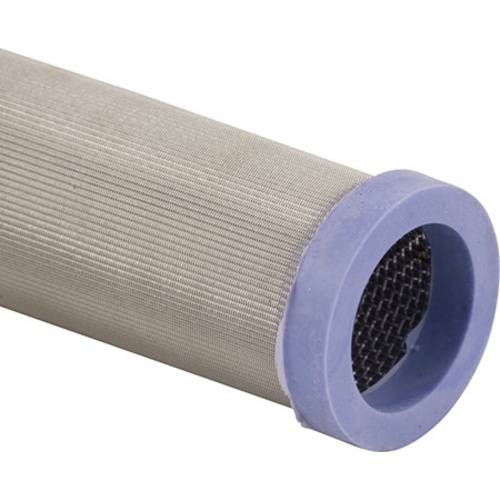 Designed to fit in any standard 10" filter housing, it comes in 1, 2, and 5 micron versions. This filter has a two stage design, with the first stage trapping hops and other large particles while the second stage filters out yeast and protein particles down to the filters rating. 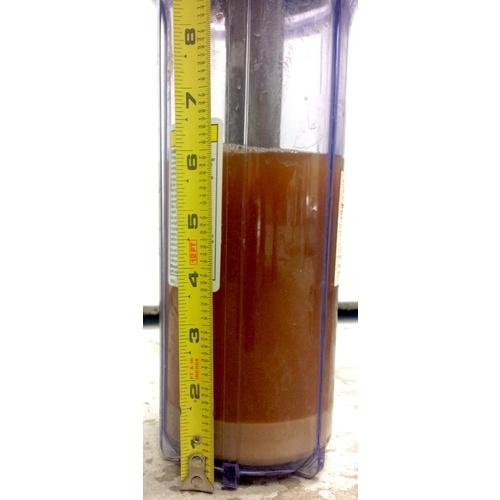 Being reusable, the Clarifier by Hastings Brew Works pays for itself in just a few filters compared to other disposable equivalents. The clarity that is achieved by this filter would normally take months of waiting for the particles to settle out of your beer. As a bonus, forcing your beer through the filter under CO2 pressure helps begin its dissolution into the beer. Need for general dry hop filtering. To test clarifying my beer. These are really nice filters I really like the idea that you can clean them and reuse them so far they have worked very well for me. No improved clarity what so ever. I bought a couple of these hoping they would be both sterilzable and reusable. The gasket would never survive even a minimal steam sterilization cycle. Additionally, the filter seems to clog way to fast. I don't know if it's a surface area problem or what but after several tries I tossed them. I've tried to filter 3 batches with the 5 micron filter. Had high hopes for this being a reusable filter, but it really didn't work very well. It works kind of like a strainer, just with a finer mesh. As a result of suffers from the same problem as a strainer, it clogs very quickly. This is what's happening to the people that are having trouble pushing the beer through the filter. If there is any amount of yeast or particulate running through the filter it clogs very quickly. The remedy is to either up the pressure, which doesn't help much, or to rinse the filter midway through (possibly multiple times). I just don't see this as a viable alternative. If I have to clarify the beer to the point that I'm pulling little to no particulate through the filter, then what's the point of the filter. I'd probably send it back except it's probably been too long since I bought it to get a refund. My suggestion would be to go back to the spun filter since you already have the water filter housing setup. Or the plate filters seem to show promise. Assuming you want to filter. On the other hand, I've had great luck with just gelatin or something like biofine. I bought a 1 and 5 micron as I was having issues with the disposable BevBrite filters--the sizes were not fitting the filter housing consistently `1/8" too tall. Bottom line: it took me 4+ hours to filter 10 gallons at 50PSI. The website says it can be a lenghty process but over 2 hours for a 5 gallon keg is ridiculous. It does filter, but nothing better than the disposable versions. If you have the time and want a reusable option, this is for you. I must be using it wrong. I have used it the 2 micron filter twice on two separate batches of beer. It filtered nothing. I have used the spun filters before and while the beer after being filtered is initially hazy, it eventually is clear. However, spun filters don't filter nearly as well as the paper filters in a plate filter. This product doesn't filter at all. I took particular care both times to follow the instructions. I made sure my "in" line was hooked up to the unfiltered beer. I pushed starting at lower pressure (about 4 psi), but had to increase the pressure as all that seemed to be going to the receiving keg in the "out" line was foam. I used it on a dark Czech lager tonight and had to crank the pressure up to 12 psi to get beer (and not foam) running through the out line. Filtering also took a very, very long time (I wish I would have timed it). After both filtering sessions, I gave a visual check. Nothing was caught in the filter. I back-flushed the filter with hot water (following the instructions) and nothing came out. The first batch I used this on was a Rauchbier. I'm almost down to the end of the keg, but the beer is as cloudy as the day I transferred it out of secondary. I was really hoping to have a re-usable filter that I could use in the much easier to use cartridge filter. But I'm disappointed in the results in using this product, so I guess it is back to the plate filter and paper filters. This is a really great product, and I'm glad I stumbled across it. I had used standard disposable filters before and was kind of disappointed with results. 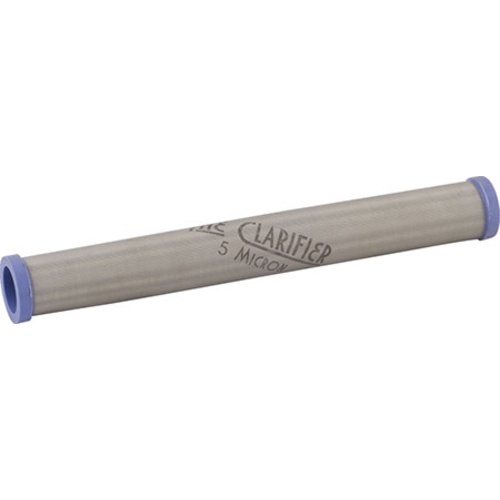 I got the 1 micron clarifier, and I am really impressed. I've been brewing for 6 years now, and have never seen homebrew this bright and clear. And it's easy to clean and reuse! A must have if you plan to filter. I was compelled to try this device to gain better clarity from my beer without filling landfills with dozens of disposable cartridges. It meets that need perfectly. 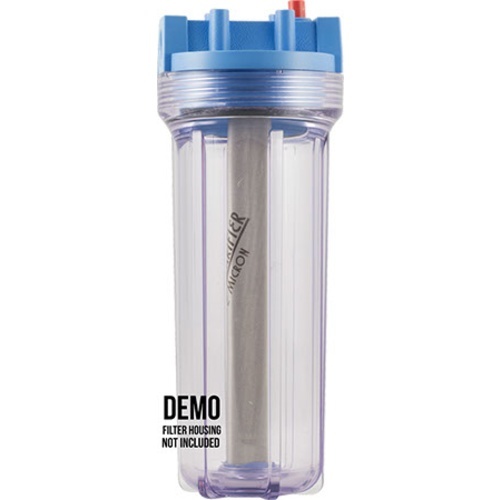 It readily inserts into a regular household water filter housing. In my experience, depending on the sediment level in your beer, it filters beer from a range of very easily with low pressume and perhaps only a half pint of loss per 5 gallon batch, all the way TO (on the other extreme) very effectively but requiring high pressure, an intermediate filter cleaning, and up to two pints (total) of loss on a high sediment 5 gallon batch. The results in both cases are excellent. The filter cleans readily by backflushing. I soak mine overnight in a thermos filled with PBW (to conserve volume) and rinse to finish cleaning. The filter can be sterilized in StarSan or by boiling. I have used mine with clarifying agents including gelatin, BioFine, and bentonite. It works fine with each, but I would strongly encourage allowing time for all sediment (whether from clarifying agents or cold crash, etc.) to settle and to avoid disturbing sediment before filtering, so as to keep the filter clear of unnecessary particles and ease the filtration process and reduce the beer that is lost in the process. I highly recommend this item.